If you want to know the difference between sea salt vs table salt, there's one thing you must realize. Not all sea salt is the same! It is all in the processing. The most important thing in eating healthy is to eat foods in their most natural state possible. Period. Any food that is processed, packaged, refined, bleached, modified, hydrogenated, cooked at high heat, pasteurized, etc, is obviously not healthy. Is any regular sea salt better for you than table salt? No, as it is still a refined food that has been heated to 2000 Centigrade, thus destroying the naturally occurring iodine and rendering it unhealthy for the body. Video - Everything you wanted to know about salt but were afraid to ask! Sifto or Windsor or other table salt is sodium chloride. It is an inorganic material. It is like a dry, hard, rock. The body does not know what to do with it because it is inorganic. It treats it as a poison, trying to eliminate it. So you get thirsty as your body wants to flush the poison from the body. It doesn't get absorbed by the body - we might absorb 3 or 4 %. All processed, packaged foods contain table salt. So many of my clients tell me they hardly add any salt to anything, but our body needs some salt. Most of the fluids in the body contain salt. The interstitial fluid, (the fluid surrounding all of the cells) the blood, our tears, amniotic fluid, all need salt. It is beneficial to the body, contains iodine, magnesium and other trace elements from the sea. It is usually grey in color and moist. 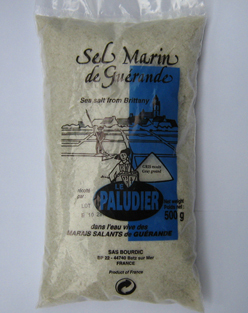 One excellent make is Sel Marin de Guerande, Le Palludier, from France.